If you are missing a fax there are 2 possibilities. First, note that faxes take approximately one minute per page to be processed and sent out. Thus, a 10 page fax may take 10 minutes to arrive. Secondly, be sure to check your spam or junk mail folder. Sometimes, automated emails, like faxes, get tagged as spam. You can easily mark anything in those folders as 'not spam and that will resolve the issue. You can also 'White list' FAXtopia.com in your e-mail settings. Older fax 'machines' can only process one fax at a time. The line is 'busy' until the entire fax is processed. Newer fax machines receive faxes into memory and disconnect quickly. We attempt to send 3 times, with a few minutes break. If, after 3 attempts, we still get a busy signal you will receive an e-mail stating that the fax was unsuccessful / busy line. If you suspect an issue with your fax number the first test is to dial the fax number from a phone line. You should get a fax tone within the first 2 rings. If you get a busy signal, or no answer, there may be a line issue. If you do hear the fax tone then one of the most common issues we see is that the sender is not dialing the number correctly. They try to 'resend' but the incorrect number is being redialed again. Please ask them to confirm they have the correct fax number. If your fax number is not answering, or generating a busy signal, please contact us. It is probably a network issue at the underlying carrier. We will get it resolved quickly. Receive up to 1,000 inbound fax pages per month. Also, you can send up to 100 outbound anywhere in the U.S. If you ever reach your monthly limits just send us an e-mail and we'll add some extra capacity to your account. There is no additional charge for temporarily increasing your inbound limits. Outbound faxing has additional costs and we can offer higher volume fax accounts. Visit this page for information on higher volume outbound faxing limits. We do not offer high volume 'automated' outbound faxing. 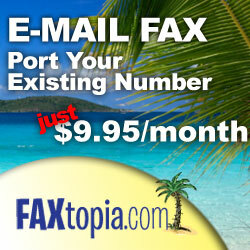 You can send up to 100 outbound 'pages' per month from the FAXtopia web portal. Once you hit that limit you will get an Over Limit Error. If you need higher outbound volumes check our page on outbound faxing. There are no effective filters for stopping fax spam. We automatically block several countries that are known spam generators but in general, individual numbers cannot be blocked. Do NOT ever mark an e-mail from FAXtopia.com as spam. That would stop all e-mail from us. See this article on fighting fax spam. You can receive all incoming faxes at two separate e-mail addresses. All faxes received will be sent to both addresses. You can add this secondary e-mail address on your 'My Account' page. There is no additional cost and it does not affect your monthly limits. Log into your account at FAXtopia.com and click the 'Web to Fax' button. Enter the recipients name and the subject. Enter the fax number, including 1 with no spaces or dashes. While there is no formal limit on the number of pages you can send outbound, larger faxes (over 30 pages) can have a higher failure rate. Also, scanned documents should be scanned at a lower resolution (100 DPI max). Larger file sizes are difficult to fax out. Much of this can depend on the receiving fax service capabilities. You will receive an e-mail confirmation of a successful transmission. 'Processing time' when sending an internet fax is typically a function of the receiving fax machine. Older fax machines may be busy for several minutes when receiving other faxes. Newer machines will store a fax in their memory and disconnect the line quickly. Our servers will make 3 attempts but if the receiving line is busy for an extended period then the fax will 'fail'. Faxes will arrive in your inbox as a pdf attachment to your e-mail address. Typically, faxes can take up to one minute per page to process and arrive in your e-mail account. Thus, a ten page fax might take ten minutes to arrive. The sender will receive a standard 'successful fax' confirmation. Receive all your faxes electronically. You can save them locally on your computer and send them out as e-mail attachments. Web faxes arrive clean and quickly as a pdf attachment in your e-mail box. See some additional comments and recommendations on converting to e-mail fax. There are tools available for signing online documents but we do not offer any. The current best method is to print the fax, sign it in blue ink, and then scan it in color. You may cancel anytime simply by logging into your account and clicking on the cancel account button. Once you cancel, there will be no further charges to your account. One last charge may appear on your credit card for the final month of service. There are no partial refunds. However, there are no cancellation fees or extra charges. Your fax number will be returned to the pool of available numbers. We will NEVER use, sell or share your personal information. We do NOT send out any marketing materials. The only correspondence you receive from us are billing notices and updates. You can cancel your account anytime. Billing is monthly and there are no refunds for any unused days. See our terms of service here.